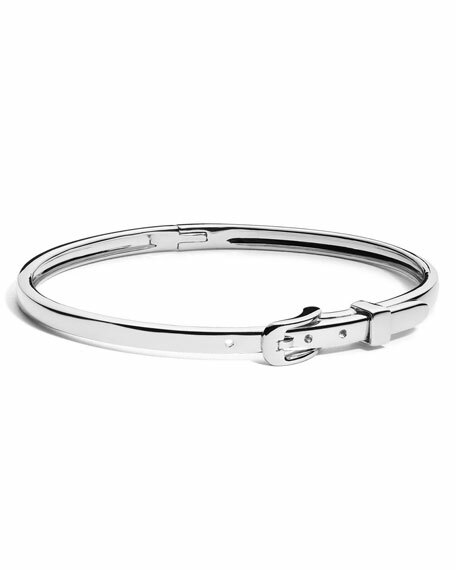 Shinola Jewelry bracelet in sterling silver. Smooth bangle with thorn buckle detail. Alexis Bittar crystal hinge bracelet. Polished yellow golden hardware. Hand-sculpted and painted Lucite®. Crystal encrusted accent stations. Approx. 2.3" diameter; 0.5"H. Hinged opening; slip-on style. Break hinge bangle bracelet by Alexis Bittar. 10-karat gold plated hardware and settings. Signature hand-sculpted, hand-painted Lucite®. Encrusted pavé Swarovski® crystal end caps. Hinged opening; slip-on style.